Stepping outside for a "layer check"
Don't be fooled by the blue sky - see if you're going to be warm enough for a day on the slopes. It's a crowd-pleaser year round. If you're still going strong after a day on the mountain, hit the fitness room. It's one of Steamboat's only indoor pools - enjoy. That magical glow is yours at the flip of a switch. Do one last gear check on the kids once you get to the Steamboat Ski Resort, an easy 3 minute ride on the complimentary area shuttle. No scraping snow and ice off the car to get to the lifts, the resort offers convenient ski-in/ski-out access. There's an indoor and an outdoor hot tub at the resort – try them both. Get your daily steps in. Emerald Mountain and Spring Creek Trail are less than 15 minutes drive from the resort. Rollingstone Ranch Golf Course is a 5 minute drive from the resort. Get ready to brag about your score. Perched above Ski Time Square, Bronze Tree has ultra-easy ski-in/walk-out access off the Right-O-Way trail, which means no remote parking/shuttle situation. How you use that extra time is entirely up to you. It buys you a more leisurely morning (seconds on pancakes!) or more time for après ski drinks around a glowing fire pit before heading back to your condo to stash your gear in the free ski lockers and figure out the plan for dinner. Bronze Tree has an indoor pool – a rarity ‘round these here parts. Take full advantage of the non-shivery walk there, with a quick sauna stop on the return trip. For those willing to brave the elements in nothing more than a swimsuit, the covered outdoor hot tub rewards your mettle with impressive views. You’re right at the ski area base, so it's an easy walk along the promenade to pick up more ski layers or replace that long-lost glove one of the kids dropped off the chair earlier in the day. Out of eats? Catch the on-call seasonal shuttle to the grocery store (bring some bag-carrying help along) – or take it a few minutes further to historic downtown Steamboat Springs and browse the shops until your table’s ready at Mahogany Ridge Brewery & Grill or Mambo Italiano. Each two-bedroom condo sleeps up to 5 mountain conquerors, and has plenty of living space for low-key evenings in – so bring your full arsenal of board games. Private balconies treat you to spectacular views of the base area, Yampa Valley and the Flat Tops in the distance. Planning to do some serious cooking? Well-appointed kitchens have everything but the groceries. Stock up with the essentials for making your family favorites, and recruit help with salad-tossing and table-setting. Once your crew has devoured dinner, make quick work of the cleanup, then break out Clue, or see if anyone can out-spell you in Scrabble. Steamboat introduced night skiing a few years back, so the fun doesn’t stop when the chairs quit running mid-afternoon. Take the Christie Peak Express high-speed chair up to the five lighted trails. (Pro tip: show your boarding pass from the Steamboat/Hayden Airport, and get one night of skiing/snowboarding free.) If the full day of skiing was more than plenty, kick back with a drink by the gas fireplaces at the Umbrella Bar, and watch for your future pros to come flying down the slopes. Want to venture beyond skiing and snowboarding? Try historic Howelsen Hill or the fun-to-say Yee-Haw Tubing Hill at Saddleback Ranch. Or hit Old Town Hot Springs – it's a crowd-pleaser all year round, with eight hot, natural mineral water pools, two 230-foot twisty water slides, lap pools and a fitness center. 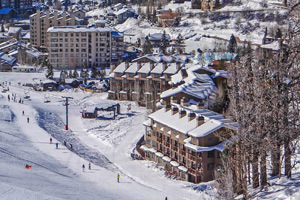 - Check-in for this property is based at a different location, at the Torian Plum Condos: 1855 Ski Time Square Drive Steamboat Springs, CO 80487. Front desk is open 8:00 AM-5:00 PM daily. Guests that are planning to arrive after hours can pick up keys from a lockbox located outside the front desk. For more details, please contact the property using the information on the reservation confirmation received after booking.